A descent can be made at a variety of airspeeds and attitudes by reducing power, adding drag, and lowering the nose to a predetermined attitude. The airspeed eventually stabilizes at a constant value. Meanwhile, the only flight instrument providing a positive attitude reference is the attitude indicator. 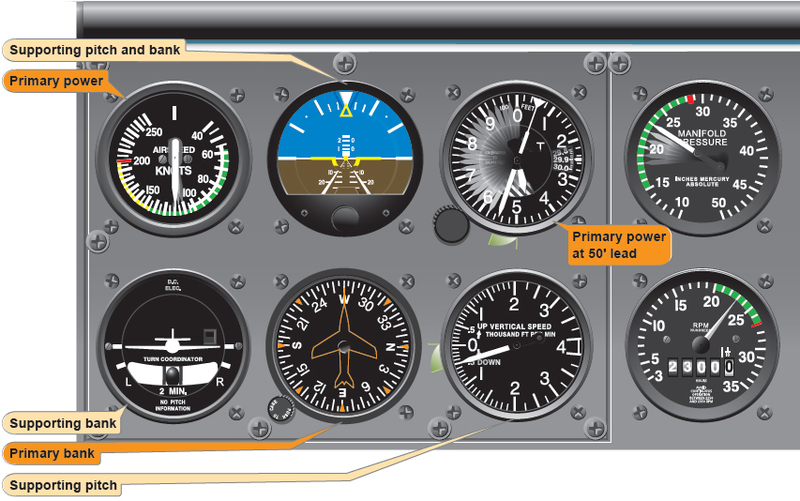 Without the attitude indicator (such as during a partial panel descent), the ASI, altimeter, and VSI show varying rates of change until the airplane decelerates to a constant airspeed at a constant attitude. During the transition, changes in control pressure and trim, as well as cross-check and interpretation, must be accurate to maintain positive control. The following method for entering descents is effective with or without an attitude indicator. First, reduce airspeed to a selected descent airspeed while maintaining straightand- level flight, then make a further reduction in power (to a predetermined setting). As the power is adjusted, simultaneously lower the nose to maintain constant airspeed, and trim off control pressures. The level off from a descent must be started before reaching the desired altitude. The amount of lead depends upon the rate of descent and control technique. With too little lead, the airplane tends to overshoot the selected altitude unless technique is rapid. Assuming a 500 fpm rate of descent, lead the altitude by 100–150 feet for a level off at an airspeed higher than descending speed. At the lead point, add power to the appropriate level flight cruise setting. [Figure 7-31] Since the nose tends to rise as the airspeed increases, hold forward elevator pressure to maintain the vertical speed at the descending rate until approximately 50 feet above the altitude, and then smoothly adjust the pitch attitude to the level flight attitude for the airspeed selected. To level off from a descent at descent airspeed, lead the desired altitude by approximately 50 feet, simultaneously adjusting the pitch attitude to level flight and adding power to a setting that holds the airspeed constant. [Figure 7-32] Trim off the control pressures and continue with the normal straight-and-level flight cross-check. Overcontrolling pitch on climb entry. Until the pitch attitudes related to specific power settings used in climbs and descents are known, larger than necessary pitch adjustments are made. One of the most difficult habits to acquire during instrument training is to restrain the impulse to disturb a flight attitude until the result is known. Overcome the inclination to make a large control movement for a pitch change, and learn to apply small control pressures smoothly, cross-checking rapidly for the results of the change, and continuing with the pressures as instruments show the desired results. Small pitch changes can be easily controlled, stopped, and corrected; large changes are more difficult to control. Failure to vary the rate of cross-check during speed, power, or attitude changes or climb or descent entries. Failure to maintain a new pitch attitude. For example, raising the nose to the correct climb attitude, and as the airspeed decreases, either overcontrol and further increase the pitch attitude or allow the nose to lower. As control pressures change with airspeed changes, cross-check must be increased and pressures readjusted. Failure to trim off pressures. Unless the airplane is trimmed, there is difficulty in determining whether control pressure changes are induced by aerodynamic changes or by the pilot’s own movements. Failure to learn and use proper power settings. Failure to cross-check both airspeed and vertical speed before making pitch or power adjustments. Improper pitch and power coordination on slow-speed level offs due to slow cross-check of airspeed and altimeter indications. 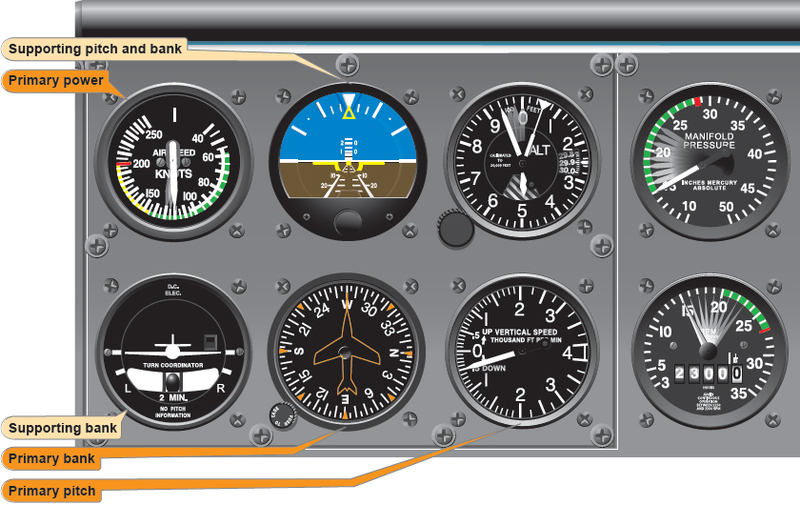 Failure to cross-check the VSI against the other pitch control instruments, resulting in chasing the vertical speed. Failure to note the rate of climb or descent to determine the lead for level offs, resulting in overshooting or undershooting the desired altitude. Ballooning (allowing the nose to pitch up) on level offs from descents, resulting from failure to maintain descending attitude with forward-elevator pressure as power is increased to the level flight cruise setting. Failure to recognize the approaching straight-and-level flight indications as level off is completed. 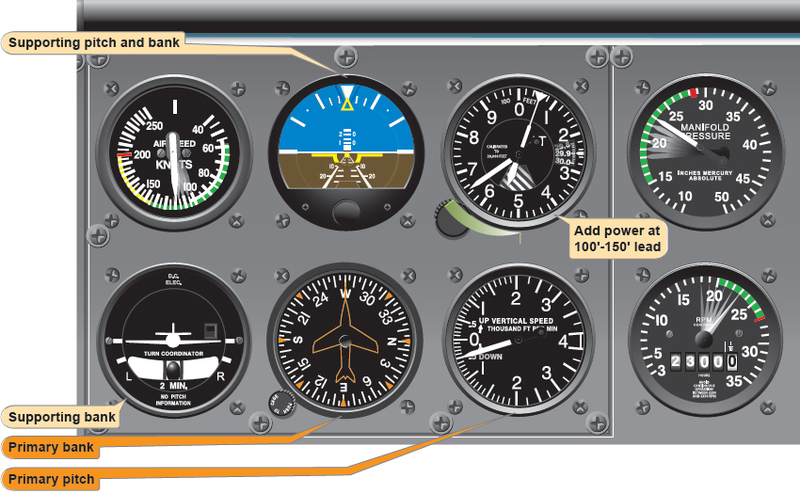 Maintain an accelerated cross-check until positively established in straight-and-level flight.